Here we share all information about automotive, ranging from engine, technology, history, tips and others. Informative articles on this site take a closer look at things you need to know about Automotive. Thanks to all our fellow readers for any comment and for your support. Automobile history in the era of the internal combustion engine. Auto Gearhead: The succesful history of the automobile is begins of applied the Internal combustion engine. An internal combustion engine is any engine that uses the explosive combustion of fuel to push a piston within a cylinder. The piston's movement turns a crankshaft that then turns the car wheels via a chain in the beginning of invented but now uses a drive shaft. The different types of fuel commonly used for car combustion engines are gasoline/petrol, diesel, and kerosene. However, there is no automobile uses kerosene nowadays . So many history books say that the automobile was invented by either Gottlieb Daimler or Karl Benz? It is because both Daimler and Benz invented highly successful and practical gasoline-powered vehicles that ushered in the age of modern automobiles. Daimler and Benz invented cars that looked and worked like the cars we use today. But in fact the very first self-powered road vehicles were powered by steam engines and by that definition Nicolas Joseph Cugnot of France built the first automobile in 1769, recognized by the British Royal Automobile Club and the Automobile Club de France as being the first. So, it is unfair to say that either Gottlieb Daimler or Karl Benz invented the automobile. 1680 - Dutch physicist, Christian Huygens designed (but never built) an internal combustion engine that was to be fueled with gunpowder. 1807 - Francois Isaac de Rivaz of Switzerland invented an internal combustion engine that used a mixture of hydrogen and oxygen for fuel. Rivaz designed a car for his engine, the first internal combustion powered automobile. However, his was a very unsuccessful design. 1824 - English engineer, Samuel Brown adapted an old Newcomen steam engine to burn gas, and he used it to briefly power a vehicle up Shooter's Hill in London. 1858 - Belgian-born engineer, Jean JosephÉtienne Lenoir invented and patented in 1860 a double-acting, electric spark-ignition internal combustion engine fueled by coal gas. In 1863, Lenoir attached an improved engine (using petroleum and a primitive carburetor) to a three-wheeled wagon that managed to complete an historic fifty-mile road trip. 1862 - Alphonse Beau de Rochas, a French civil engineer, patented but did not build a four-stroke engine (French patent #52,593, January 16, 1862). 1864 - Austrian engineer, Siegfried Marcus, built a one-cylinder engine with a crude carburetor, and attached his engine to a cart for a rocky 500-foot drive. Several years later, Marcus designed a vehicle that briefly ran at 10 mph that a few historians have considered as the forerunner of the modern automobile by being the world's first gasoline-powered vehicle. 1873 - George Brayton, an American engineer, developed an unsuccessful two-stroke kerosene engine (it used two external pumping cylinders). However, it was considered the first safe and practical oil engine. 1866 - German engineers, Eugen Langen and Nikolaus August Otto improved on Lenoir's and de Rochas' designs and invented a more efficient gas engine. 1876 - Nikolaus August Otto invented and later patented a successful four-stroke engine, known as the "Otto cycle". 1876 - The first successful two-stroke engine was invented by Sir Dougald Clerk. 1883 - French engineer, Edouard Delamare-Debouteville, built a single-cylinder four-stroke engine that ran on stove gas. It is not certain if he did indeed build a car, however, Delamare-Debouteville's designs were very advanced for the time - ahead of both Daimler and Benz in some ways at least on paper. 1885 - Gottlieb Daimler invented what is often recognized as the prototype of the modern gas engine - with a vertical cylinder, and with gasoline injected through a carburetor (patented in 1887). Daimler first built a two-wheeled vehicle the "Reitwagen" (Riding Carriage) with this engine and a year later built the world's first four-wheeled motor vehicle. 1886 - On January 29, Karl Benz received the first patent (DRP No. 37435) for a gas-fueled car. 1889 - Daimler built an improved four-stroke engine with mushroom-shaped valves and two V-slant cylinders. 1890 - Wilhelm Maybach built the first four-cylinder, four-stroke engine. Engine design and automobile design were integral activities, almost all of the engine designers mentioned above also designed cars, and a few went on to become major manufacturers of automobiles. All of these inventors and more made notable improvements in the evolution of the internal combustion vehicles. One of the most important landmarks in engine design comes from Nicolaus August Otto who in 1876 invented an effective gas motor engine. Otto built the first practical four-stroke internal combustion engine called the "Otto Cycle Engine," and as soon as he had completed his engine, he built it into a motorcycle. Otto's contributions were very historically significant, it was his four-stoke engine that was universally adopted for all liquid-fueled automobiles going forward. In 1885, the famous German mechanical engineer, Karl Benz designed and built the world's first practical automobile to be powered by an internal-combustion engine. On January 29, 1886, Benz received the first patent (DRP No. 37435) for a gas-fueled car. 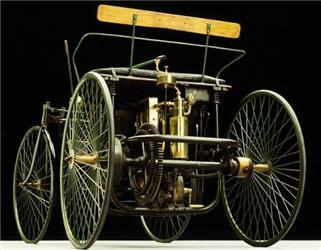 It was a three-wheeler; Benz built his first four-wheeled car in 1891. Benz & Cie., the company started by the inventor, became the world's largest manufacturer of automobiles by 1900. Benz was the first inventor to integrate an internal combustion engine with a chassis - designing both together. And in 1885, Gottlieb Daimler together with his design partner Wilhelm Maybach, took Otto's internal combustion engine a step further and patented what is generally recognized as the prototype of the modern gas engine. Daimler's connection to Otto was a direct one; Daimler worked as technical director of Deutz Gasmotorenfabrik, which Nikolaus Otto co-owned in 1872. There is some controversy as to who built the first motorcycle Otto or Daimler. The 1885 Daimler-Maybach engine was small, lightweight, fast, used a gasoline-injected carburetor, and had a vertical cylinder. The size, speed, and efficiency of the engine allowed for a revolution in car design. On March 8, 1886, Daimler took a stagecoach and adapted it to hold his engine, thereby designing the world's first four-wheeled automobile. Daimler is considered the first inventor to have invented a practical internal-combustion engine. In 1889, Daimler invented a V-slanted two cylinder, four-stroke engine with mushroom-shaped valves. Just like Otto's 1876 engine, Daimler's new engine set the basis for all car engines going forward. 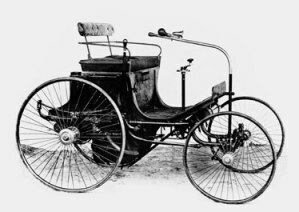 Also in 1889, Daimler and Maybach built their first automobile from the ground up, they did not adapt another purpose vehicle as they had always been done previously. The new Daimler automobile had a four-speed transmission and obtained speeds of 10 mph. Daimler founded the Daimler Motoren-Gesellschaft in 1890 to manufacture his designs. Eleven years later, Wilhelm Maybach designed the Mercedes automobile. That is the history of the invented and development of automobile industry, with all people of the automobile advocates of change involved in it. What is Nitrous Oxide System or NOS and How Does It Make The Car Go So Fast? Are hybrid cars slower than regular cars?